No Pity Party This Time! Selected for PASS Business Analytics Conference! Got the best email ever! 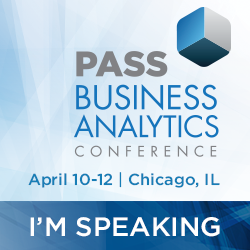 I got accepted to speak at the PASS Business Analytics Conference! I keep reading the email making sure I read it right. There it is though, says “selected” right next to my submission! It’s the first time I’ve been selected to speak at one of the big conferences! And not for lack of trying and submitting to several over the years. I became very accustomed to the Twitter woe is me pity parties. No pity party required this time! So I get this email and start to have a moment that felt a bit like one of those teenager movies. I’ve been the awkward girl who’s likeable enough but always gets the response from the guys or PASS in this example, “It’s not you, it’s me”. After much swooning and many SQLSaturdays, my time finally has come. Jake Ryan, I mean PASS, picked me up in the Porshe and we had our moment where we sat on the table with a birthday cake between us. Ok it’s a little bit of a stretch from a John Hughes movie but was what came to mind when I got that email. I got accepted to speak at PASS BA Conference! I’m so excited and so glad I finally get the chance to speak at one of these conferences.